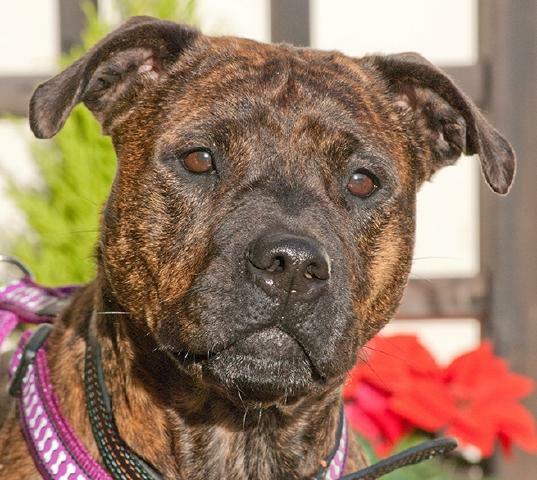 Homing Requirements: Gemma is a bigger girl so a family who can support her with the 'prejudice' around in the public while she melts most hearts on meeting. She is well intentioned, but gets excited as she prepares to go for a walk as the young dog she is. Gemma would delight in a secure garden and also a training class to optimise her bonding with her handler and use her obvious intelligence. Unassessed for cats or as a live-in with other dogs. 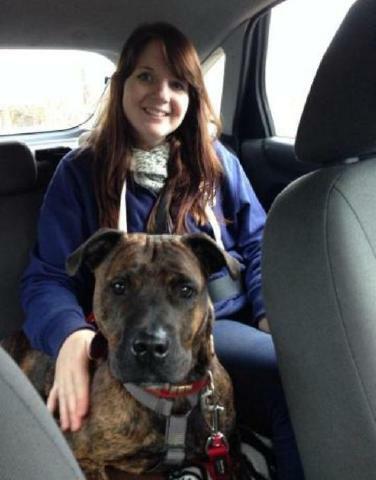 Her Story: Gemma was found stray obviously having had pups and abandoned. She was taken into our rescue as her reclaim days were over and she was at risk of being moved into a 'high kill pound'. Gemma is neutered, chipped and vax'd. Currently in boarding kennels near Godstone, Surrey. Advert: What a GEM! 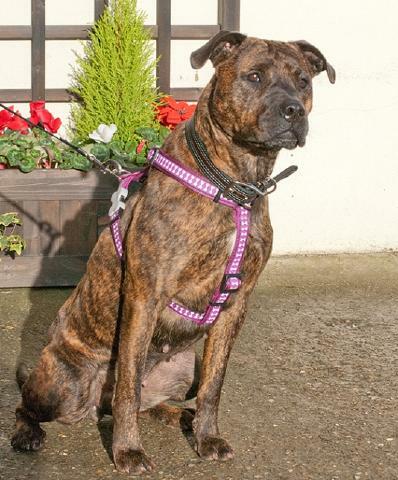 Gemma is a joy and popular with everyone who meets her at the kennels, especially those who discover her through offering her a walk. She doesn't pull on her lead and is gracious when meeting other dogs but its clear that her eyes are for her handler! Gemma travels well and seems clean in her kennel. Gemma is young and vibrant and has so much to offer. 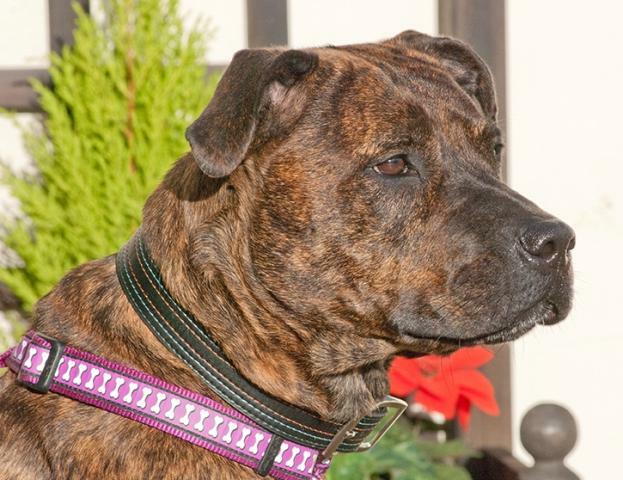 Gemma is an 18 month old Staffie X; orange Brindle with amber eyes. Winter kennels have taken its toll, reflecting on her coat and the dullness in her eyes. Her health has held out and she has a strong constitution. Gemma is keeping in good spirits as she has so many friends. Gemma is, we all agree, a special lady and easy in many ways. 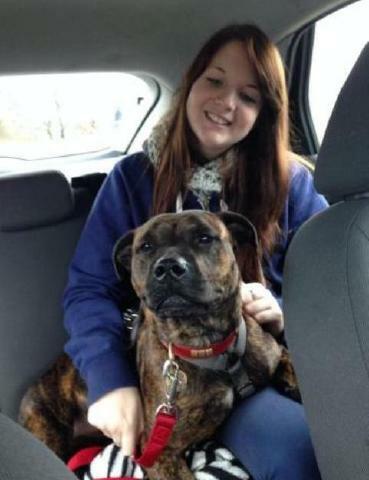 Interested in homing Gemma? Please click to complete our on-line homing questionnaire to match a suitable dog with your lifestyle. 18 months had pups. Good with other dogs. Still puppyish herself. 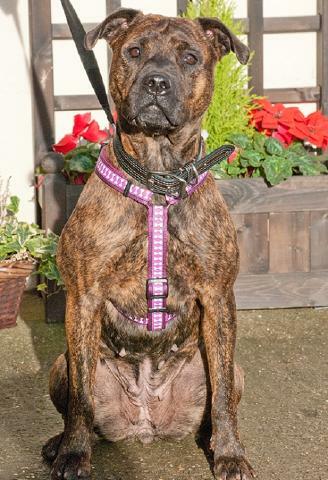 Gorgeous brindle! I have had her spayed.